Thanks to a fantastic friend of mine who shares many of the same musical tastes as I do, I found a new band I can’t stop listening to. My friend sent me 13 hours worth of music she loves and thought I would love too. 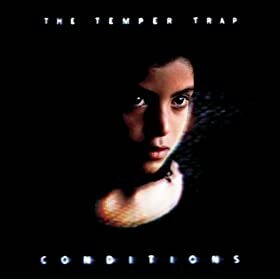 To make a long story short, as of this posting, I’ve only gotten through about 3 hours of music and 1 of those hours happened to be the 1- track album called Conditions by an Australian band called The Temper Trap. I had never heard of them before, but as I went through each song, I kept being blown away. Have you ever been in the mood for just hearing something new as well as really good? On top of that, you might be looking for a sound you just haven’t heard before? Well, that’s what The Temper Trap was for me. After many repeats, I found that certain songs invoked similarities to other artists I’ve heard before, which isn’t a bad thing. In fact, I wouldn’t be surprised if they were some sort of inspiration. Anyway, one song, “Soldier On” sounded like a Led Zeppelin song to me. Another song, “Fader” (nice music video, btw), had a Maroon 5 vibe to it. This is all in my opinion, by the way. But one thing is for sure, I feel these are some original artists and I may not understand what all of their songs are about, but that doesn’t keep me from looping it dozens of times in a single hour. Coming soon to the Indoob is a Grooveshark widget feature which I will try out on the sidebar. Eventually I’ll change it up since I’d love for others to be exposed to the awesome music I enjoy regulary. This was brought to my attention by my same friend who introduced me to The Temper Trap, who, on a side note, I may be seeing in a couple weeks in NYC. So perhaps there might be a part 2? And call me a little crazy, and I don’t blame anyone for thinking I’m trying to make a stretch to connect this band or that last song I played to LOST, but doesn’t the lead singer kinda look like Miles Straume (Ken Leung), or is it just me? Well I may be back for a special edition and addition post all about how they perform live. I expect nothing less than great and I can’t wait for their next album… even though this one pretty much just came out. Did I also recommend (500) Days of Summer to you ? I am surprised you didn’t find The Temper Trap then ! I really want to see them in concert now ! And yes, I thought the same thing, lead singers looks like Ken Leung ! (500) Days of Summer was recommended to me by like 5 people. I eventually gave in to watch it after I think the 5th or 6th person told me to watch it.